Hope everyone had a wonderful Eid celebration with family and friends. We in deed had a great time with our friends and family. I cannot think of Eid celebration without Biryani, so I made my favorite Fried Chicken biryani (with some modifications). 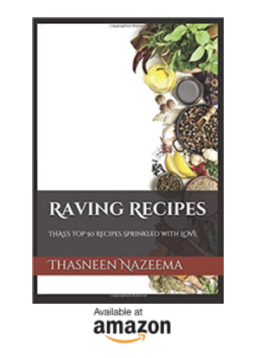 This time I used Kaima rice which is more flavorful than the regular Basmati rice. In the evening, I had to attend an Eid party at my friend’s place and I had promised her that I would bring a dessert. Making Trifle was in my mind. 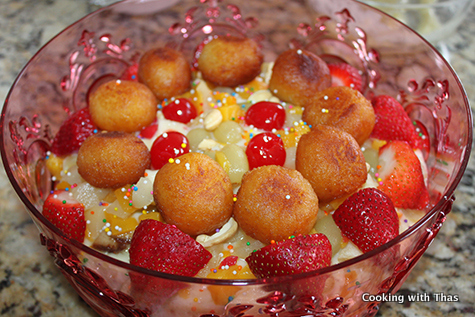 Vanilla cake was topped with custard and mixed fruits/nuts. After I started layering the trifle, I really got into that spirit and personalized it by topping gulab jamun as the top most layer, sprinkling M&M’s and sprinkles over it. 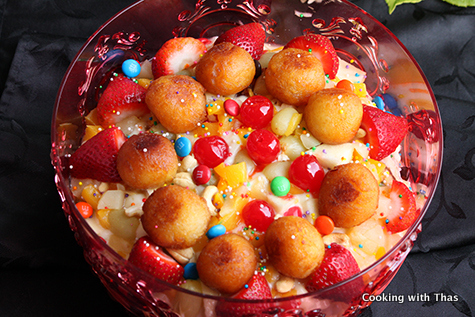 Definitely, a delicious dessert to make for special occasions and parties. 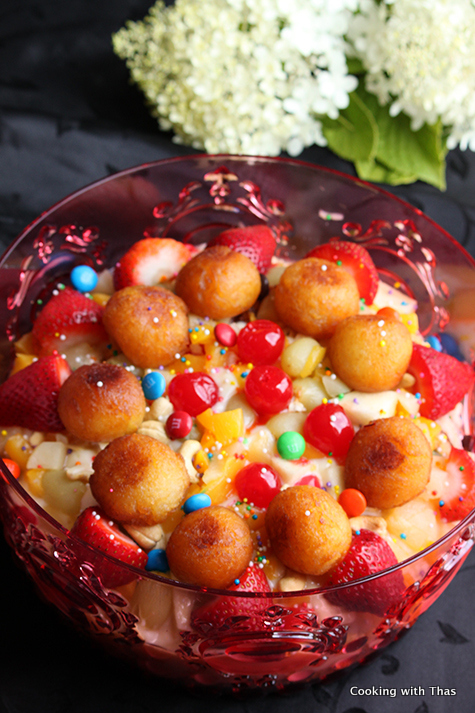 You could make the cake, custard and gulab jamun (dip them in sugar syrup) the previous day of the occasion/party and assemble it the next day morning and chill it for 3 to 4 hours. Line the bottom of a 9 inch round cake pan with parchment paper, grease the bottom and sides of the pan with butter; keep aside. In a small bowl, combine together the flour, baking powder and the salt; set aside. Combine milk and butter in a saucepan over low heat and let it come to a boil. Using an electric mixer, beat eggs and sugar on high speed for 4-5 minutes or until thick, lightened in color and the mixture holds together for several seconds when the beater is lifted. Gradually whisk in the dry ingredients (flour/baking powder/salt) just until incorporated (don't over mix it). With mixer on low speed, add the hot milk mixture to batter; mix just until smooth. Mix in vanilla and transfer the batter to the cake pan and smooth out the top. Bake until golden, about 35-40 minutes, until a fork when inserted comes out clean. 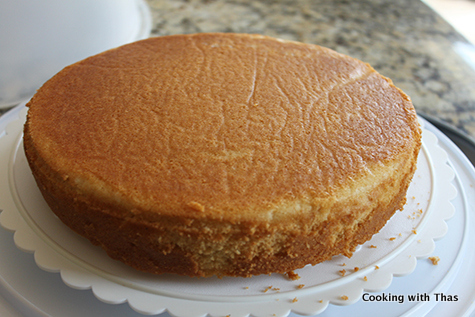 Cool cake for 10 minutes in the pan, remove from pan and transfer to a rack or a platter to cool down. In a medium saucepan, combine together sugar, corn-starch and salt. Add milk slowly and dissolve the cornstarch completely. Place the saucepan over medium heat, stirring constantly until the mixture starts to boil. Reduce heat to low, stirring constantly and cook for a few minutes. The mixture will start to thicken, whisk constantly. It's very important that you keep stirring otherwise lumps will be formed and the bottom layer will set. 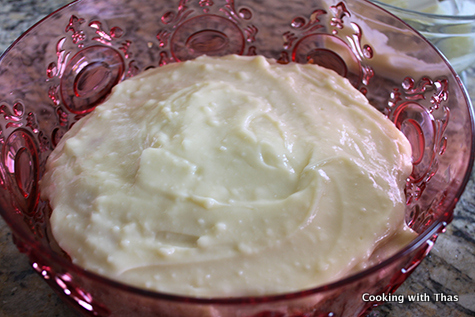 Stir butter and vanilla extract into hot pudding and combine well. Place a plastic wrap directly on the surface of the pudding (to prevent the formation of skin on the pudding). Chill for 3 hours or overnight in the refrigerator. Using a sharp knife, cut the cake horizontally into two equal halves. Layer in a 9 to 10 inch glass bowl, the cake should fit into the bowl. 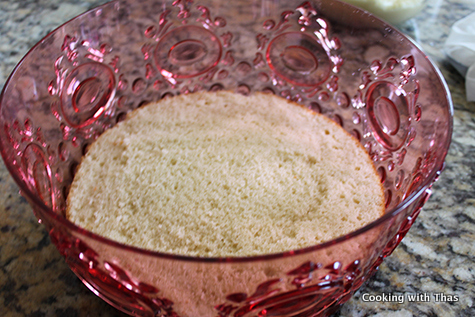 Place the bottom cake layer as the first layer into the bowl. Evenly spread half of the prepared chilled custard over the cake layer. 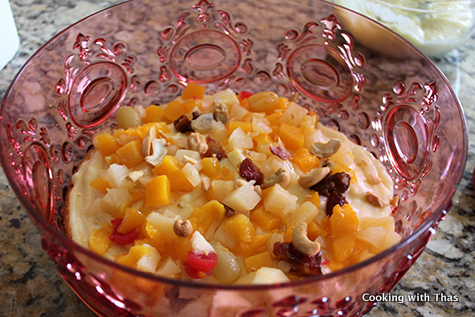 Spread mixed fruits and nuts over the pudding. Place the other half of the cake over the pudding, again spread the remaining custard over it, spread mixed fruits and nuts. To make the trifle more fancy and colorful, you could place halved strawberries along the edges. I even arranged a few gulab jamuns as the top most layer (I used store bought mix for making gulab jamun, fried it in oil and dipped them in sugar syrup over night). Sprinkled some M&M's, sprinkles etc. Get creative and personalize your trifle to your likings. Keep the trifle in the refrigerator for 3 to 4 hours before serving. While serving, you could cut into wedges and serve on a dessert plate. Leftover trifle can be refrigerated for a couple of days. Make the cake. custard and gulab jamuns if using (dipped in sugar syrup) one day ahead and assemble everything in the morning of the party day, let refrigerate for 3 to 4 hours.